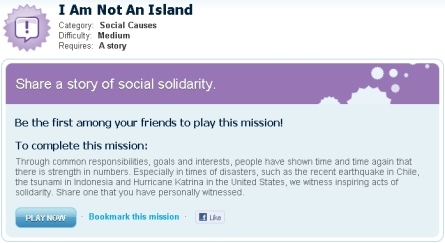 Civics, Popular Media & Participatory Culture» Blog Archive » Akoha – a Direct Action Game? How can we make everyday civic participation more compelling? There is a new kind of game on the horizon, one that experiments with real-world action. I call them “direct action games,” because they restructure acts like volunteering, activist training, and charitable giving. One early prototype is Akoha, which launched last year, quite off the radar of traditional civics activities. At first glance, Akoha looks like a media hub for a do-it-yourself Boy Scouts. Their website and iPhone app reveal thousands of participants, many reporting on success with real-world “missions,” from going vegetarian for a day, to debating the “I Have a Dream” speech. The actual missions often take place offline, but are only acknowledged when documented with photos and stories for the online community. Participants are mostly adults, but the ages vary widely. The experience is deeply social, as friends create missions for each other, and share their stories. More formal recognition for participation comes as players earn badge-like awards — such as “multi-talented” for those who complete one mission in every possible category. Participation begins with the usual click of a button, yet the specific language of “Play Now” differs sharply from the tool focus of civic action websites (e.g., “Take Action Now;” or “Sign the Petition”). But what exactly does it mean to ‘play’ Akoha? Is it a game? This profile has evolved much as the community has coalesced. Just a few months prior, the player described himself in much more formal terms, emphasizing his offline profession — a “freelance Air conditioning and Refrigeration engineer by qualification and profession,” his belief in God, and how he found the site via Reader’s Digest. Now, in this recent screenshot, the player has removed his back story, and describes how his Akoha playing strategy is driven by his personality. His refined self-presentation aligns with the pragmatics of the Akoha community, which focuses on choosing missions and writing stories — both depending more on personality than professional accomplishments beyond the community. Using the mobile interface, Akoha missions can be documented on a bus in real-time, or browsed from a neighborhood park. This is a fairly basic use of mobile, focused on interfacing with established Internet content, independent of geography. 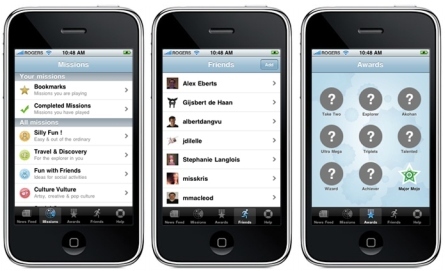 Yet Akoha’s mobile interface is only minimally aware of specific places. Place matters, especially in civics. (The neighborhood of our birth strongly predetermines a host of life opportunities, from income to education and governance.) By improving Akoha’s mobile support for place, its implications for civic activity would be more immediate and profound. In particular, Akoha might offer support for filtering missions for one’s own neighborhood, or connecting with players who are geographically nearby for joint missions, or simply allowing missions to release new clues when players arrive at specific locations. Games are still discussed as individual indulgences. Yet increasingly, games are recognized as social forces. This is especially true for Akoha, where the social construction of value emerges over time, as a participant’s “friends” share stories about their missions and accomplishments. Different communities are likely to form over time. It is not yet clear whether Akoha is dominated by preexisting networks of offline friends, or by more interest-driven networks of people who gather around a shared passion. This is a central debate around civic communities, and there is hope that Akoha may avoid the pull into left/right politics that Sunstein fears by providing a safe space for civic discussion. Reimagining place is important civic work, just like the reimagining of societal values, tax policy, and even collective heroes. The value of games is to restructure this civic work around different rules – intrinsic motivations of the game, aligned with the desires of everyday people. Sometimes people want an excuse to be more civic. In my interview with Eberts, he confessed that one of the big surprises for his team was how much everyday people wanted support for being even more explicitly civic with the activities and missions of Akoha. He hinted that future Akoha versions would expand support for civic engagement. Even as mobile has reshaped the everyday experiences of place and time, so too we may see game-like activities begin to restructure the experience of public participation. Yet Akoha remains an “edge phenomenon” to both the civic and gaming communities. In the first case, nonprofits are still trying to understand games for training, let alone for direct action; in the second, the independent gaming community is struggling to understand games for art, let alone games that improve the real world. Akoha is likely to be seen as a risky investment for funders in either community. Thus the evolving Akoha business model may be as crucial as its innovations in civic participation, and is worth watching. Eberts hints that corporate engagement may be one area to watch. More broadly, Akoha raises questions about the definition and implications of direct action games. This was the subject of a panel I organized this year at Games for Change. Here is a video of the panel, featuring game designer Tracy Fullerton and activist/scholar Stephen Duncombe. Can games help us re-imagine civic activity under a different set of rules? If only a portion of the activity is civic, how do we appropriately value our investment in the overall activity? Where is the psychology of civic participation aligned with that of playing games? When is it appropriate to teach citizens how to “game the system” of democracy, and of our communities? This entry was posted by Benjamin Stokes on Thursday, December 30th, 2010 at 2:16 pm and is filed under Uncategorized. You can follow any responses to this entry through the RSS 2.0 feed. Both comments and pings are currently closed.